Isn't it looking stunning in the bottle? If you love bright, glittery nail polishes then this post is for you. I love using red nail polishes. They instantly make you feel dressed up. If you are a subscriber of Fab Bag you would you the team included a US brand "Cuccio Colour" in January 2016 Fab Bag as your product choice. I chose the shade "Manhattan Mayhem" which is a glittery, gorgeous color that looks absolutely stunning just by looking at the bottle. It is priced at Rs 675 but you can BUY ONLINE HERE at an offer price of Rs 405. The packaging of Cuccio nail polish is very classy and looks like a high end brand! Manhattan Mayhem is a super gorgeous warm red color with matte finish. 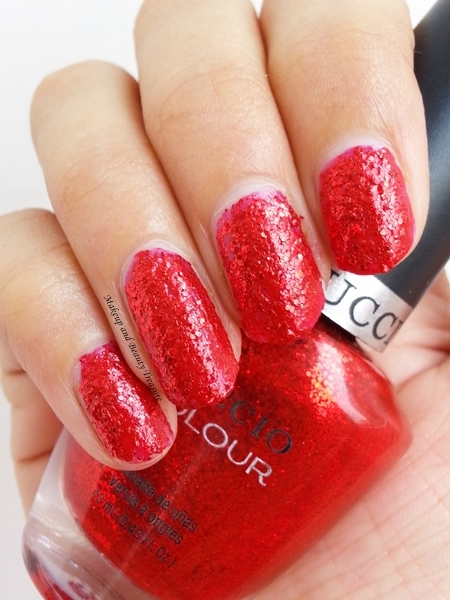 It has red glitter that instantly makes the color look glam and to-go-to-party-nail-color. Before applying a dark nail polish, always make sure to apply a base nail polish to avoid staining on nails. After the base coat dries, apply the nail polish. You get reddish pink color with a single coat. With 2 coats, you get the actual color as in the bottle. It dries quickly and I do not need to wait to apply a top coat. Since it contains glitter, it does feel a bit rough on the surface but not overly so. With this nail polish, I have to make sure to apply a top coat. Without top coat, the nail polish starts chipping at the tip the next day! With the top coat on, it stays for at least 2 days with no chipping. Let me tell you I do household chores like dusting and cooking where I need to wash my hands few times. It instantly brightens up my nails and goes well with all my outfits! - Great pigmentation. Gives true color in 2 coats. 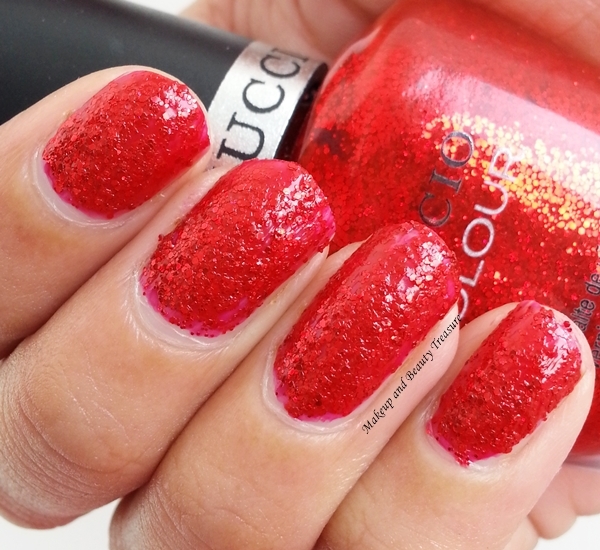 - The red glitters makes the nail polish look stunning and perfect for party wear. - The bristles are soft and applies nail polish easily. - Toluene and DBP free! 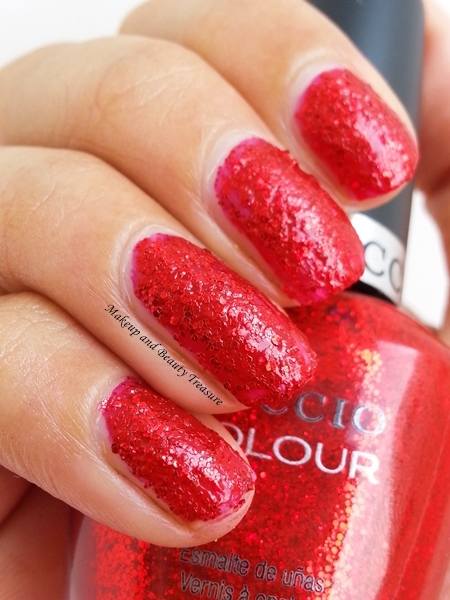 Overall Cuccio Nail Polish is a good quality nail polsish that looks stunning and very pretty on nails. They have glitter chunks that looks glam on nails. I would definitely recommend it to all nail polish lovers! - Apply base coat to avoid staining on nails. - Apply top coat to make it last longer. - You can use it as a nail art polish too! - Remove the nail polish easily using Hip Hop Nail Polish Remover! Have you tried Cuccio Nail Polish? What shade did you like? I have this one too but glittery nail paint are not my choice. I always go for matt one. You can check out its other shades. I think they have few matte ones!!! Lovely shade although those glitters are making it look lumpy. Nice review! Aaah they look good in person!! Thank u!! Yes Fatima. I wish it lasted longer!!! Arey nahi Bushu it looks great on nails too in person!!! Texture and finish are somewhat different!!! It is a beautiful shade with less staying power.